The Wexford Massacre Irish folk Song Lyrics And Guitar Chords. Written by M.J. Barry. Recorded by The Grehan Sisters from Boyle in the County Of Roscommon. Chords by Marc. 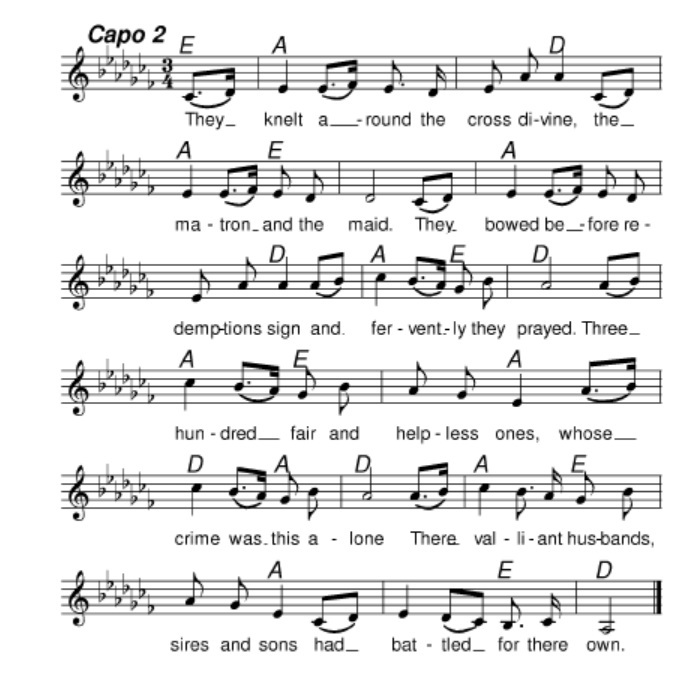 (use a capo on the 2nd fret 4/4) The sheet music is included. Oliver Cromwell fineshed the process of the English conquest of Ireland. It had began centuries before in 1169 by Henry 11. By the end of the Sexteeneth century Irish resentment was manifesting itself in full scale rebellion and in attacks on planter settlements throughout Ireland. Men whose land had been stolen from them and given to the English had started to fight back. They had being driven into bogs and woods.This was the start of the rising of 1641. At the same time England was dealing with it's own civil war. No army was sent to Ireland to put down the rebellion until the English war was over and where Charles 1 was exicuted. The council of state decided to turn it's attention to Ireland. The obvious man to lead the attck on Ireland was Oliver Cromwell who was one of the founders of ''The New Model Army'' and was thaught of as a brilliant military commander who had led it to victory against the king. He left with his army of 15,000 men on the 12 August 1649 determined to crush the Irish as quickly as possible. He began his campaign of terror by committing one of the greatest atrocities in the entire troubled history of Ireland. The burning and massacre of the town of Drougheda. The savagery of the slaughter that followed it's capture was unlike anything that happened in the English Civil Wars. All the defenders of this garrison and most of it's civilian population were put to death by sword. The few survivors were transported to The West Indies. Cromwell followed the attack on Drougheda with the massacre of the port town of Wexford. Between 15,000 and 20,000 rebels and civilians were put to death. During his reign of terror Cromwell was in the process of land grabbing for which his name has also become famous in Ireland. All the land that had belonged to Catholics was taken and given to soldiers as payment. Cromwell had no regrets about the severity of his policy in Ireland. He wrote, We came by the assistance of God to hold forth and maintain the lustry and glory of English liberty in a nation where we have undoubted right to do so. On the 18 of May 1650 Oliver Cromwell went home to England. He spent only 9 months in Ireland but the cruelty of his visit is remembered to this day.